Tristan, Tristan, Tristan… we expected better of you. Truly, we did. It turns out the Cleveland Cavaliers player couldn’t just take one L (we’re looking at you, NBA playoffs), but it turns out that the basketball player might still be cheating on the mother to his daughter, Khloe Kardashian — who many think are still together. Well, when they said Tristan Thompson was a serial cheater, maybe we should have listened a little more carefully. The basketball player has been in big trouble with both the public and the Kardashian family (make sure you see THAT video at the end of this article), but it seems like he has yet to learn the error of his ways. The NBA star, who is supposedly still with his baby mama Khloe Kardashian, has allegedly been seeing his ‘former’ side piece Lani Blair still, one source told In Touch. And not only had he been physically seeing her, which would be bad enough in this situation, but he also was basically paying for her entire life. “Tristan still sees Lani on the low and gives her thousands of dollars a month for clothes, her hair, mani and pedis, and some pocket change,” the insider said about their relationship, which sounds totally not at all suspicious. That’s a lot of pocket change if you ask us – and we can’t imagine his baby mama feels differently. However, that lump sum has changed tremendously since Tristan not only shoved a basketball in Draymond Green’s face (after apparently defending Khloe), but also failed to leave the court in a timely manner – meaning he just got fined in a major way by the NBA. “Now that Tristan got fined $25,000 by the NBA, he told her he can’t pay her and that she’s on her own for the month,” the snitch continued. And apparently Lani isn’t exactly thrilled that the 27-year-old won’t be financing her any more. “Lani feels he’s taking out his frustration on her,” the insider said. Wow, one whole month without Tristan’s money. What a hard life that must be for the 28-year-old. If this is all true, it’s made extra worse by the fact that Lani allegedly tried to apologize to the new mom recently. “She really feels bad for what she’s caused both Khloé and Tristan,” the insider added. As Celebuzz! readers know, TMZ obtained video footage recorded in October 2017 — around the time Khloé was three months pregnant with their daughter — allegedly showing the basketball player kissing one woman while a different woman groped him at the Darna hookah lounge near Washington D.C. In the grainy surveillance footage, Tristan appeared to be making out using tongue with a mystery brunette. After braking away, the other woman wrapped her arms around him to pull the star’s face close to her chest. 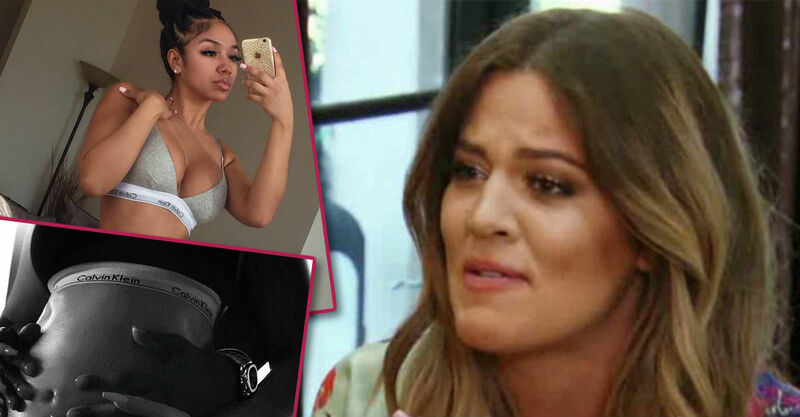 This all came to light just days before Khloe was set to give birth, making her situation every new mom’s nightmare. The insider continued by saying that Khloe had been “beyond head over heels” in her relationship. Now that the Cleveland Cavaliers lost in a super embarrassing championship game against the Warriors, maybe Tristan will be able to refocus on his family some. The Keeping Up With the Kardashians star has seemed to have forgiven Tristan, and has been seen at his basketball games and out on a few dates since she gave birth to her first daughter. And according to Radar Online, Khloé’s man has been boasting to friends in private about how the 33-year-old Keeping Up with the Kardashians star will “never have the guts to walk away” from him. “It might sound delusional but Tristan actually thinks he can get away with anything now,” a source told the outlet. The insider explained since Khloé is still in Cleveland after giving birth to daughter True Thompson, Tristan has gotten it in his mind that he’s been totally forgiven and can get away with practically anything now. Sadly, this isn’t the first time that Khloe has had to deal with being cheated on. She famously ended her marriage with her first husband, Lamar Odom, back in 2013 after his own cheating scandal and drug relapse came to light.